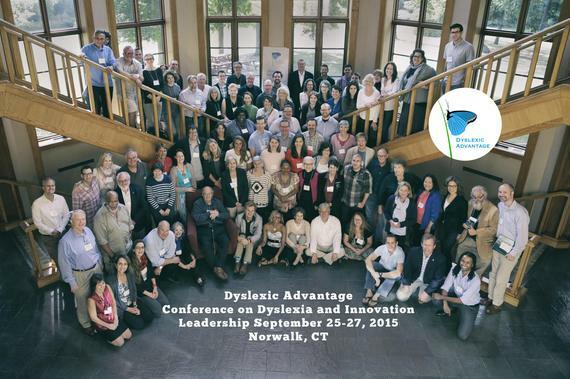 I am writing this post flying back to the west coast after attending the 3rd Annual Conference, renamed Dyslexia and Innovation, run by The Dyslexic Advantage, the non-profit founded by the authors, and supported by the Emily Hall Tremaine Foundation. It has been approximately two and half years since I was sitting at Newark Airport and felt compelled to write the blog post Reflections, New Insights, Confessions, and Inspiration on Dyslexia and Talent about my experience at the first annual Dyslexia and Talent conference. The focus of the conference was to explore the concepts in the book The Dyslexic Advantage by Drs. Brock and Fernette Eide. Back then the paradigm was a new one -- dyslexics have different minds made for different jobs and tasks. These minds are able to recognize patterns, make connections, create unique designs and structures, and conceive novel solutions to complex problems -- in a way different than most typical minds. The conference was different than any other I had ever experienced in my decades of work. First, the vast majority of the speakers, who consisted of highly successful entrepreneurs, Pulitzer prize authors, Academy Award winning filmmakers, and scientists and professors from Harvard and MIT and other well respected institutions, as well as the attendees, were predominantly dyslexic. And because of this there was an overwhelming feeling of acceptance and emotion that I still find difficult to describe -- most dyslexics (myself included) felt like we had come home for the very first time. As one speaker announced, "We have found our tribe." Fast forward to 2015: I am writing this post flying back to the west coast after attending the 3rd Annual Conference, renamed Dyslexia and Innovation, run by The Dyslexic Advantage, the non-profit founded by the authors, and supported by the Emily Hall Tremaine Foundation. This year's focus was to assess the current state of dyslexic awareness across sectors -- schools, policy, workplace, and image -- and develop strategies and action plans to continue to move the needle and experience for dyslexics across their lifespan. For those who were new to the conference, there was a similar feeling of overwhelming emotion and connection -- a finding of their tribe for the first time. The rest of us were returning home. Most of us are used to feeling a bit anxious about schedules, timelines, writing, remembering names, and tracking lots of auditory information. Here we felt relaxed and at ease. While talking to fellow dyslexics and hearing the experiences of the non-dyslexics, who described feeling like a minority, I realized that at this conference, we dyslexics were the dominant culture. Most of us can't remember names and room numbers, get lost regularly, are bad at spelling, mispronounce words, and often can't find the word or phrase we are trying to express. When any of these things happens at this conference, and it does regularly, we laugh together and smile with recognition and acceptance. This is very different than our usual experience of being laughed at, ridiculed, and feeling shame. In the real world we are about 20 percent of people. Here, we are the 80 percent. We are normal here. Like all prior conferences (and like the YouTube video phenomena Because I'm Dyslexic) highly creative and accomplished people from a number of disciplines spoke and let discussions -- a Harvard trained business negotiator, an MIT scientist, a bear expert (! ), a comedian, a poet, visual and graphic designers, and others. All of these individuals have come up with something new in their fields and have found success. All of them are doing it differently than others. All of them struggled in school, experienced repeated failures, hid their dyslexia and related weaknesses from others (when they could), and persevered in the face of adversity. There was a common theme of risk taking -- "I failed so many times that I was used to it. What did I have to lose?" Their failures in doing things the way they were "supposed" to led to using creative problem solving and dyslexic strengths to do it differently, and not fear the failure that they knew all too well. I learned that Singapore has teacher training and national programs for dyslexia as part of their education curriculum and they see every student as a precious resource for their country's future. They apparently do not want even one of their students to fall short of their potential. I also unfortunately got confirmation -- that very little has changed for dyslexic students in America across the country. When my work group was asked if dyslexic strengths were starting to become part of intervention plan, the sad conclusion was not only were they not, but the foundational research based intervention for reading was often not given to dyslexic students even if they were identified as dyslexic. Even worse, as in my state of California, many states aren't allowed, or don't use the word "dyslexia," and many parents have heard statements from teachers and educators such as, "Dyslexia is an outdated term" and "Dyslexia is not recognized anymore." The world has been changed and entertained by dyslexic minds for centuries and the list continues to grow. More and more dyslexics are stepping out and talking about how their dyslexia has shaped their lives. The list includes Steven Spielberg, Kobe Bryant, Magic Johnson, Jewell Loyd (WNBA rookie of the year), George Clooney, Jennifer Aniston, and Barbara Corcoran and Daymond John from Shark Tank. Also included are scientists such as Nobel Laureate Carol Greider, MIT Professor Cathy Drennan, and MacArthur Award winning scientist Mimi Koehl. All seven made man wonders have been designed by dyslexic architects, one in three successful entrepreneurs are dyslexic, and at MIT, dyslexia is called the MIT disease. See a pattern here? The media is helping to raise awareness as more and more famous people continue to step forward and talk about their dyslexia. It is easier to step out when you are accomplished and accepted. It is difficult when you are struggling and failing. The concept of dyslexia seems to be getting some traction, but we are far from seeing changes in schools and the work place. The dyslexic mind is not yet seen as a valuable resource, and the dyslexic child and adult are still marginalized. The world has many complex problems that need to be solved and I believe the dyslexic mind is built for solving these problems. We need all of our minds -- both dyslexic and non-dyslexic -- to sustain and advance our world. Like Singapore teaches us, our society cannot afford to lose even one student because we all need to reach our potential. The time for The Dyslexic Revolution is now.